Yeast is a tiny plant-like microorganism that exists all around us – in soil, on plants and even in the air. It has existed for so long, it is referred to as the oldest plant cultivated by man. The main purpose of yeast is to serve as a catalyst in the process of fermentation, which is essential in the making of bread. The purpose of any leavener is to produce the gas that makes bread rise. Yeast does this by feeding on the sugars in flour, and expelling carbon dioxide in the process. As the yeast feeds on the sugar, it produces carbon dioxide. With no place to go but up, this gas slowly fills the balloon. A very similar process happens as bread rises. Carbon dioxide from yeast fills thousands of balloon-like bubbles in the dough. Once the bread has baked, this is what gives the loaf its airy texture. There are two types of dry yeast: Regular Active Dry and Instant Yeast (also known as Fast-Rising, Rapid-Rise, Quick Rise, and/or Bread Machine Yeast). The two types of dry yeast can be used interchangeably. The advantage of the rapid-rise is the rising time is half that of the active dry and it only needs one rising. You can speed up standard yeast bread recipes by changing the yeast in the recipe. Substitute one package Instant or fast-acting yeast for one package regular active dry yeast. Instant yeast is more finely ground and thus absorbs moisture faster, rapidly converting starch and sugars to carbon dioxide, the tiny bubbles that make the dough expand and stretch. Active dry yeast has a larger particle size than Instant Active Dry Yeast, making it necessary to proof, usually with water, before using. Recommended water temperatures will vary by manufacturer between 100 degrees to 115 degrees F. as measured with an Instant Read Thermometer. Cake yeast (compressed yeast) is considered fresh yeast. It is sold in tiny cakes in the refrigerated section of many supermarkets. Fresh yeast does not keep well; it will last about two weeks if refrigerated. It is mainly used by professionals as it is highly perishable and must be used within a short time of opening. Open Package – Active dry yeast will keep well beyond its expiration date printed on the package for one (1) year if unopened at room temperature. It will keep longer if frozen. Place directly in the freezer in its vacuum sealed container. If frozen, you can use it directly without thawing. Unopened Package – If opened, active dry yeast will keep 6 months in the refrigerator and 12 months in the freezer. Keep yeast in its original container with the opened flap folded closed in a resealable plastic bag. tored at room temperature and opened without a protective outer container, it loses its power at about 10% per month. I use Instant Active Dry Yeast in all my breads. I use 1 teaspoon of instant yeast per cup of flour. If the recipe calls for over 3 cups of flour, I still use only 3 teaspoons. 1 (6-ounce) cube or cake of compressed yeast = 1-1/2 to 2 teaspoons instant yeast. Substitution: To substitute instant or bread machine yeast for active dry yeast, use 25% less instant yeast than active dry. See Conversation Measurements below. Instant or Rapid Rise Yeast does not require warm liquid to be activated. This type of yeast has been genetically engineered from different strains of yeast to produce breads. Rapid rise yeast is also more finely granulated than active dry yeast, so it does not need to be dissolved in water first. It can be added directly to the dry ingredients, making it a popular choice for use with bread machines. Instant active or rapid rise yeast is added to the dry ingredients. Then, the liquid portion of the recipe’s ingredients, warmed to 120 to 130 degrees F, as measured with an Instant Read Thermometer, are added to make a dough. When using Instant Active Dry Yeast, the bread recipe only needs one (1) rise. The first rise is replaced by a ten minute rest, and you do not need to “punch the dough down” afterwards. The second rise takes place after the dough has been shaped into a loaf. It will take approximately one hour in a warm place (longer in the refrigerator as a slow rise) until the dough is just about doubled in bulk. Storage of Instant Yeast: Instant yeast will keep a year at room temperature if unopened. If opened, it will keep 6 months in the refrigerator and 12 months in the freezer. Keep yeast in its original container with the opened flap folded closed in a resealable plastic bag. Sourdoughs were originally produced by wild yeasts. The wild yeasts in the San Francisco area produce a unique flavor in breads. Some sourdoughs are over a hundred years old. 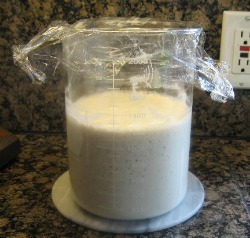 The starter (or sometimes called a sponge) is a flour and water mixture that contains the yeast used to rise the bread. You can buy dried versions and then activate them or you can make your own, catching the wild yeasts indigenous to your area. Check out How To Make Sourdough Starter. Or purchase Packaged Sourdough Starter Mix at the grocery store or by mail-order. This is what I originally did many years ago. Multiply the amount of instant yeast by 3 for the equivalent amount of fresh yeast. Multiply the amount of active dry yeast by 2.5 for the equivalent amount of fresh yeast. Multiply the amount of instant yeast by 1.25 for the equivalent of active dry yeast. Expiration Date (printed on the yeast’s package) – Yeast does expire. Yeast will last longer than the date printed on the packet if it is kept in the refrigerator. It will last even longer in the freezer (for up to a year or even more). Testing Yeast – Sugar is used in testing yeast. To test yeast: Add 1/2 teaspoon of sugar to the yeast when stirring it into the water to dissolve. If it foams and bubbles within 10 minutes, you know the yeast is alive and active. You do not need to be exact in measuring yeast. Remember itis going to multiply like crazy anyway. A little less is fine; the dough will rise more slowly and may taste better. NOTE: Too much yeast will give an unpleasantly yeasty flavor and aroma. Check out Linda Bread Recipes using the Bread Machine. These are really interesting infos about yeast. I didnt even know yeast are microorganism that exists all around us. And this article answer one of mine question about difference between active yeast and instant yeast. I am doing a science fair project on this and it was really helpful. I want to cite the source so may I know the person who published this is name? You can source Linda Stradley at Whatscookingamerica.com. I’m not sure your yeast conversions are correct. Less instant/rapid or active/dry is necessary in place of fresh cake yeast. So if 10g fresh, used 5g dry active or 2.5g of instant rapid. or I’m confused in how I’m reading it. I think I see now you mean for the amount of fresh yeast used is final amount so it is more. Ok.